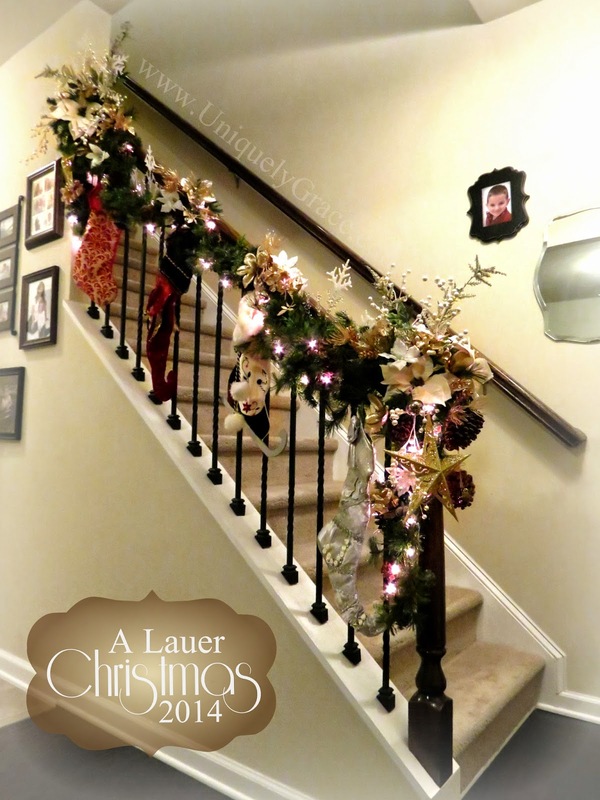 I am thrilled to be adding the Part 2 to this series, A Lauer Christmas Home Tour. One fantastic thing about his is I get to share my new home with my family and friends who have not been able to see it since we now live so far away. 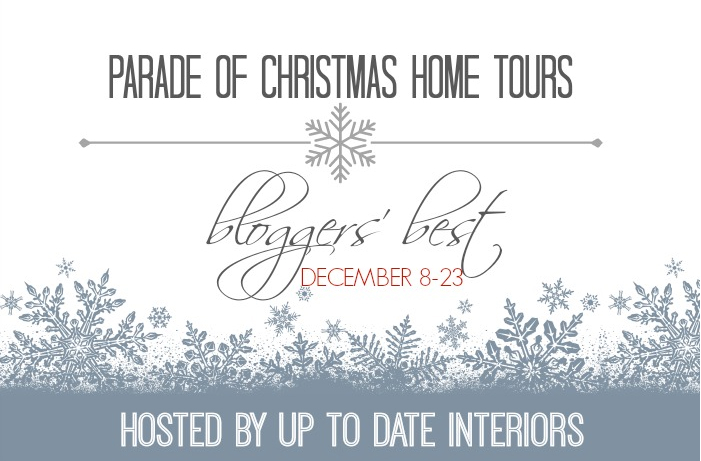 Today I am honored to be a part of a second Parade of Christmas Home Tours! This home tour has been well organized and generously hosted by Up To Date Interiors. Thank you Kathryn for allowing me to be a part of your special on Bloggers Best homes. Now let us get started, grab a cup of tea or coffee and take a few min to come on in, and let me show you around. Enjoy, and please subscribe or find me on my social media and follow, share, pin or comment your thoughts. Thank you for your support! I just love the arches that cross between the dinning room and our back living room. We have two, one very large one with a 10' arch and a smaller one with a 3.5' wide arch. 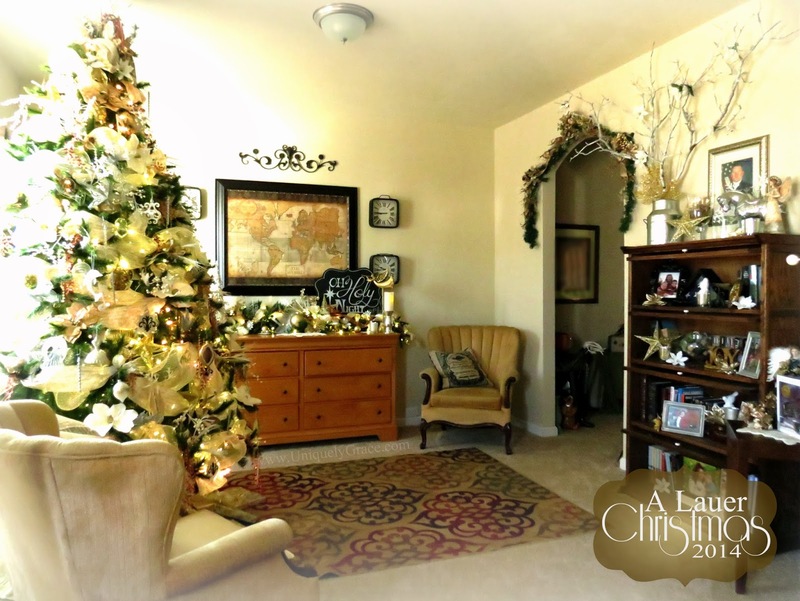 When we bought the house I knew I wanted to put our Christmas Tree there! 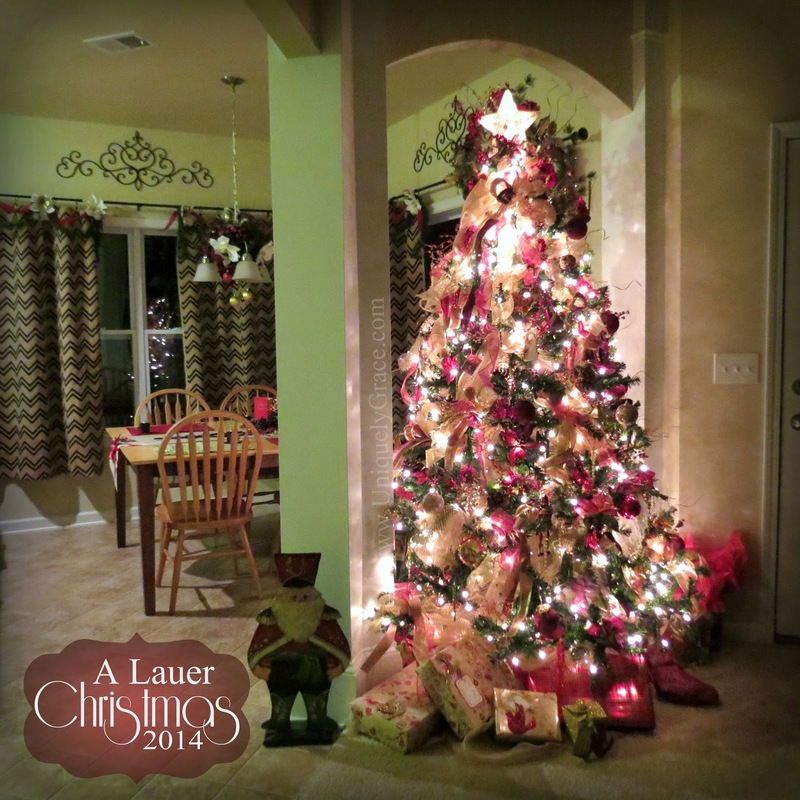 It was perfect, we only had one tall tree but we had high ceilings in this new home of ours. So this would be a perfect spot to nestle the tree into and with the arch it makes the tree seem taller as it reaches up to the center of the arch. 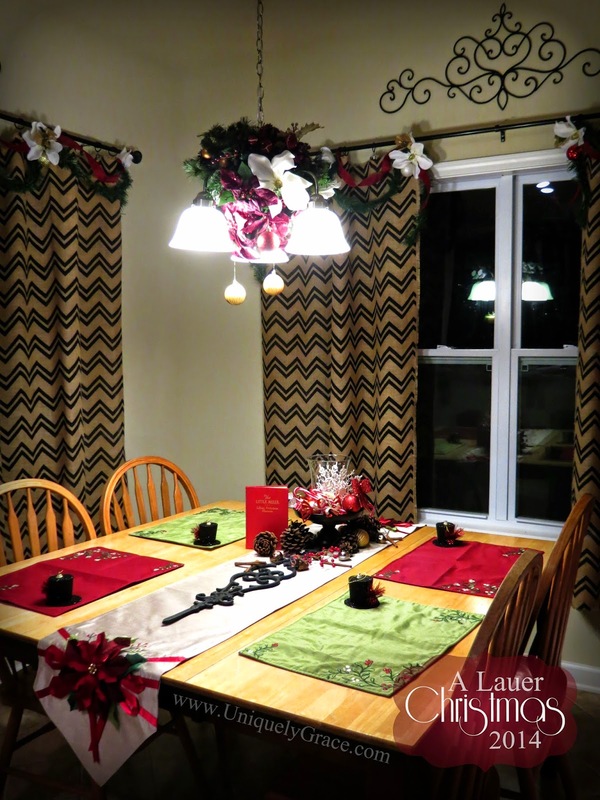 The decor in the dinning room is a mix between the red and white in the kitchen and the red, gold and burlap in the back living room. 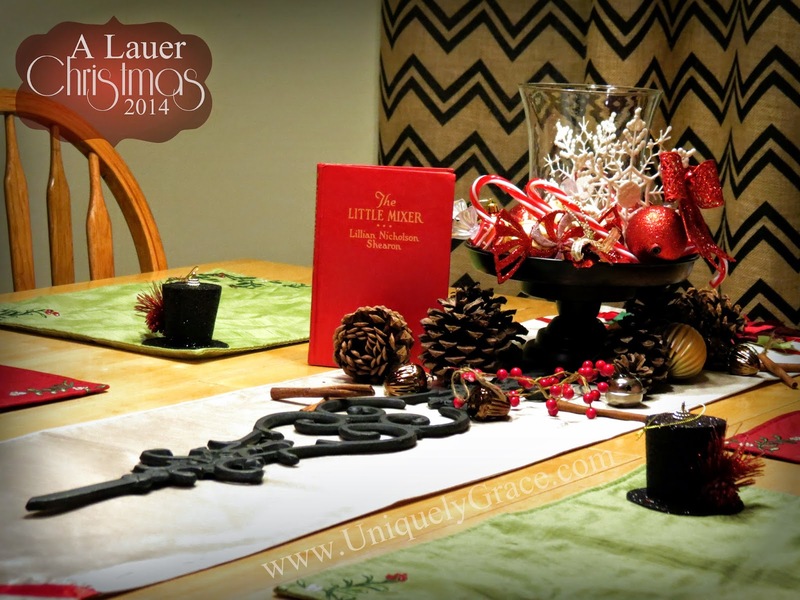 The center piece is a Better Homes and Garden's candle holder filled with Dollar Tree Ornaments. 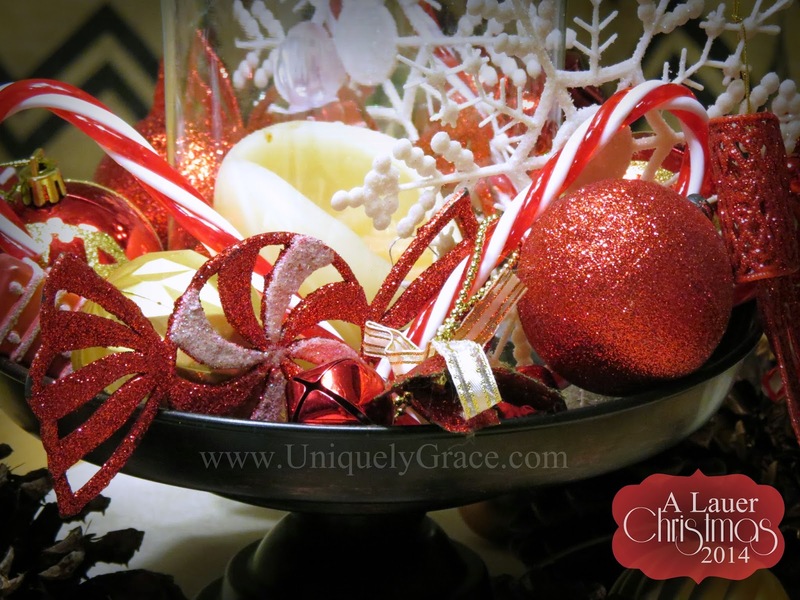 I just love apothecary jars and this one full of sweet candy cane goodness is not exception. It gets decorated for every season or holiday. Cardinals have a special place in my heart. Luckily they are found everywhere at Christmas time. My Grandfather used to sit in his bed, ill and unable to go outside, and watch the cardinals feed on the bird feeder outside his window. He has left this world now and is up in heaven with his maker. Though it's been over 5 years since his passing, the last days I was able to spend with him was during Christmas when he would tell me all the local cardinal's names as they came to feast outside his window. 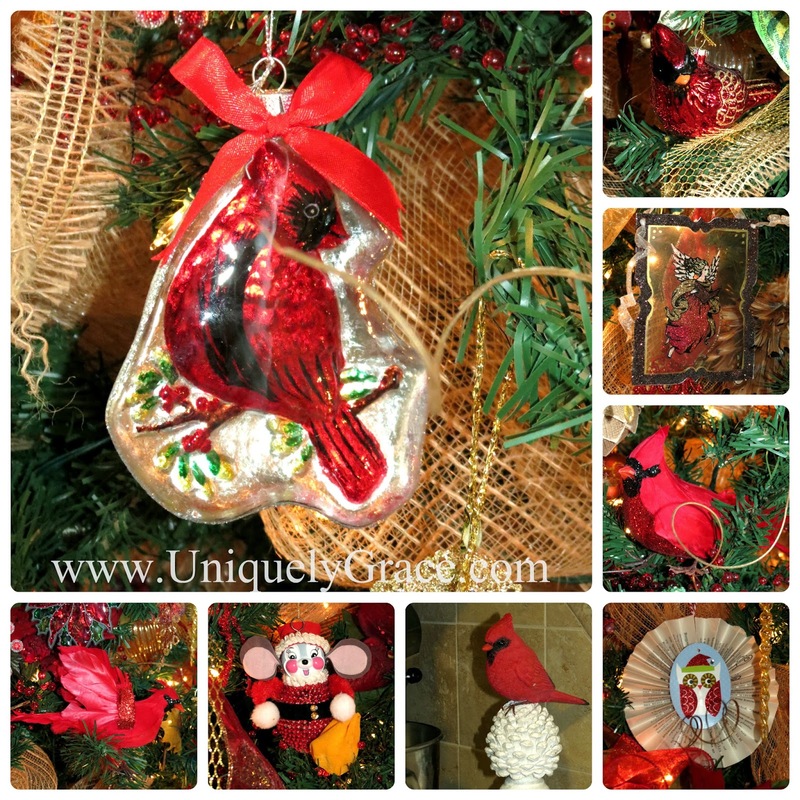 Cardinals were his favorite and this time of year seeing them everywhere brings him a little closer to me once again. 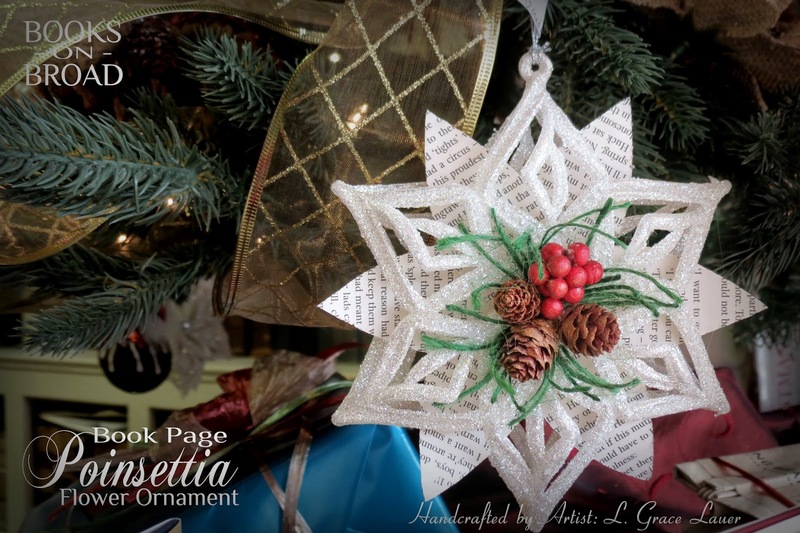 If you want to see more of my Holiday Book Page art and ornaments please check out these links. I always love little surprises when people visit my home and they remember the details. 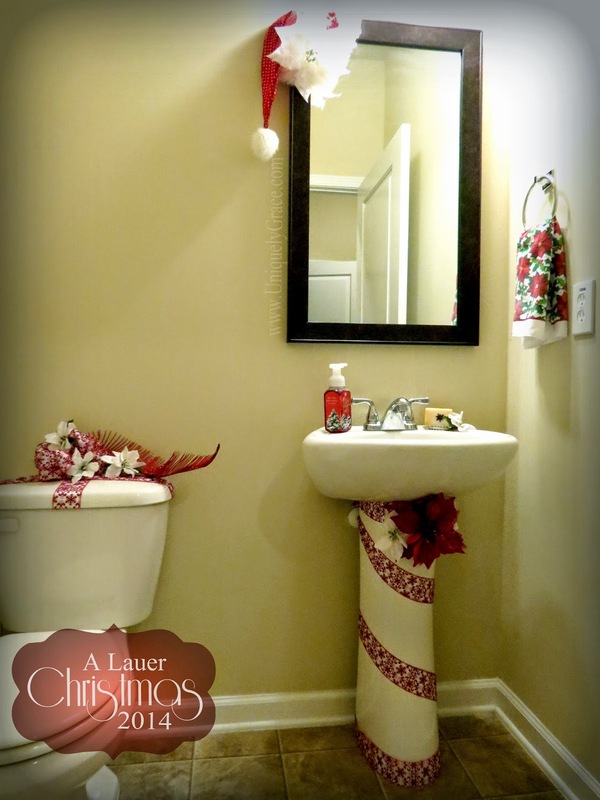 Like decorating the powder room. It's a relatively small space so it doesn't need much to make an impact. Some extra flowers and ribbon, a few bows, a Santa hat and some wonderful paper snowflakes my nine year old daughter made for me. Wrap the lid to the tank like a fancy present. 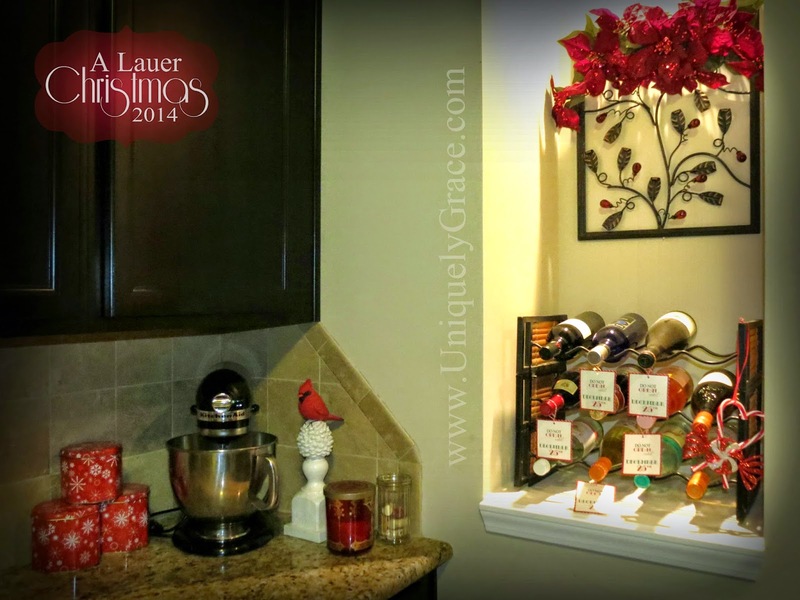 The kitchen is one of my favorite spots during the holidays! I love to bake and cook for entertaining friends and family. A few years ago I stumbled into a Dollar Tree to get something really quick and it happened to be the week they put out all their Christmas items. If you have never shopped there the seasonal items sell out very quickly. As I peeked at all the goodies (yes some on their own look very cheap) I started to see a theme. 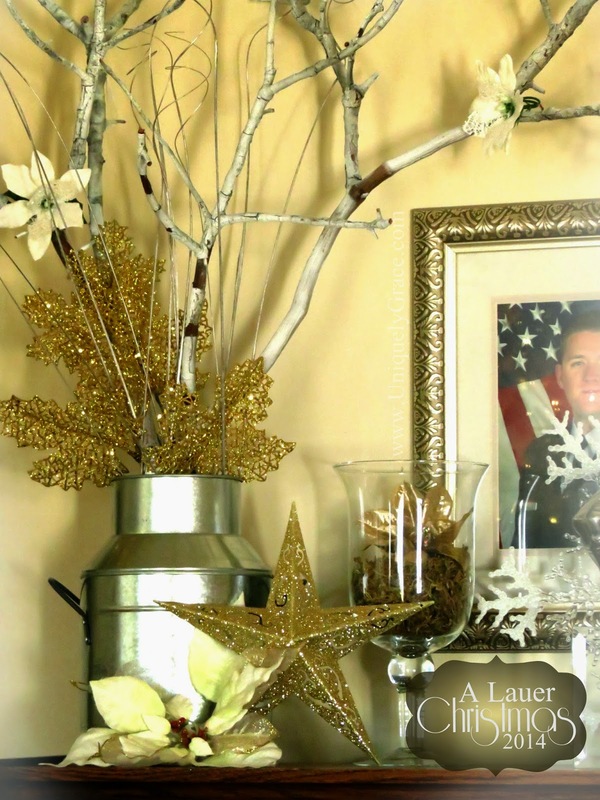 Something very easy to do, costing very little for an entire room decor and something very sweet (wink). 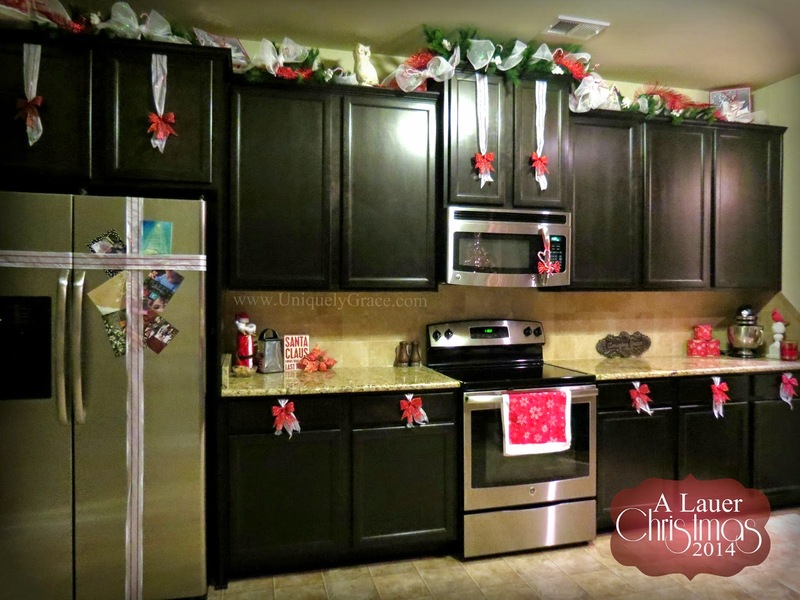 I purchased all the rolls of white ribbon with red sequin stripes, red glittered bows, candy ornaments 2/$1.00, bags of 12 plastic candy canes and other tid bits that coordinated including the towel, the gift bags at the top of the cabinets and the white mesh. 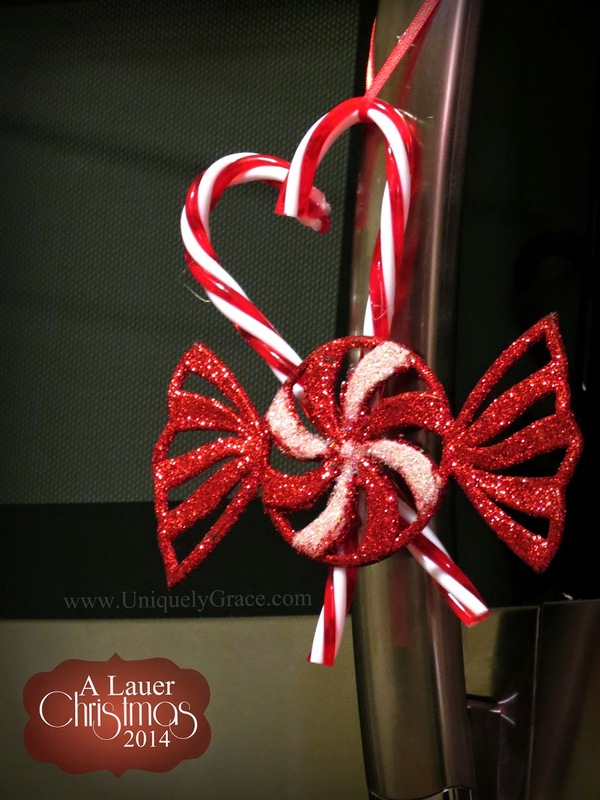 The plastic Candy Canes were glued together with hot glue into the shape of a heart and decorated with a larger wrapped candy ornament. Thank you so much for spending your precious time with me during this holiday season. 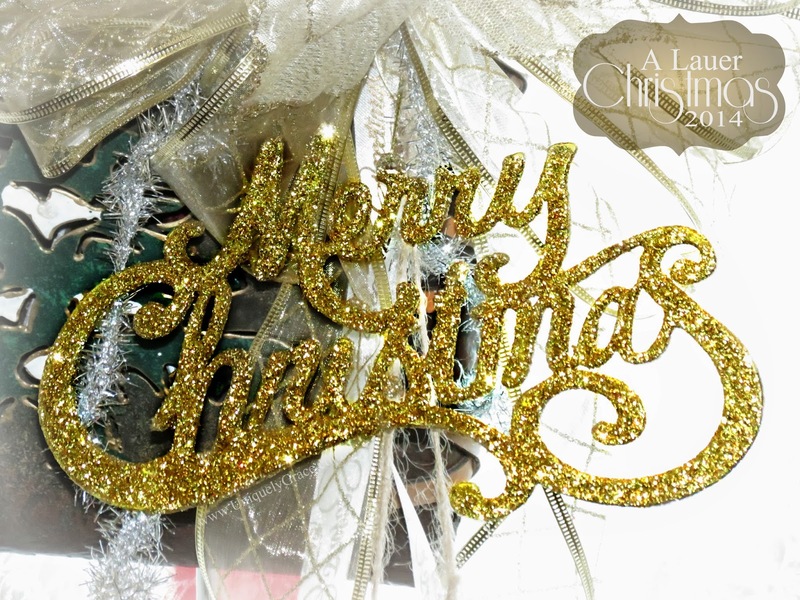 I want to wish you all a very Merry Christmas and a Happy New Year! Please leave your comments below, pin, share and follow if you like what you see. This year I am doing something a little different. 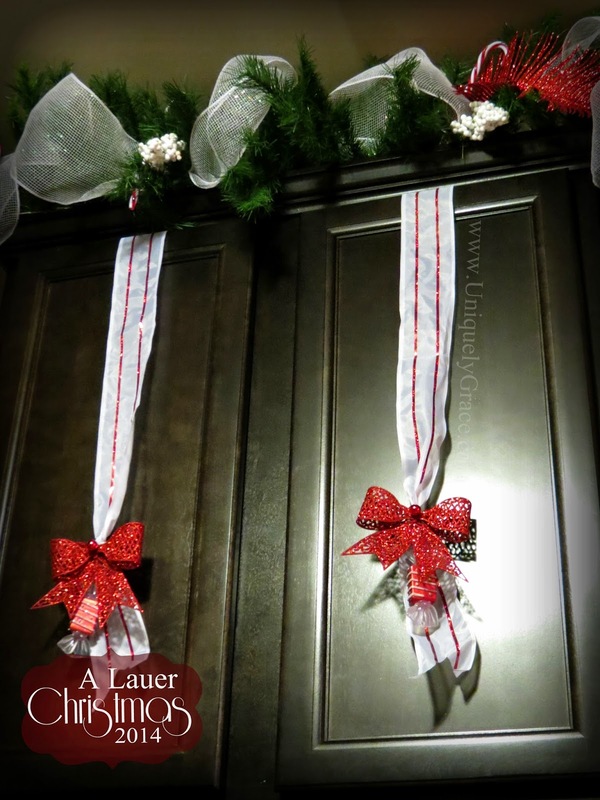 I will be showing you inside my home this holiday season with a series of posts (Second post - Kitchen, Bath and Dinning Room). 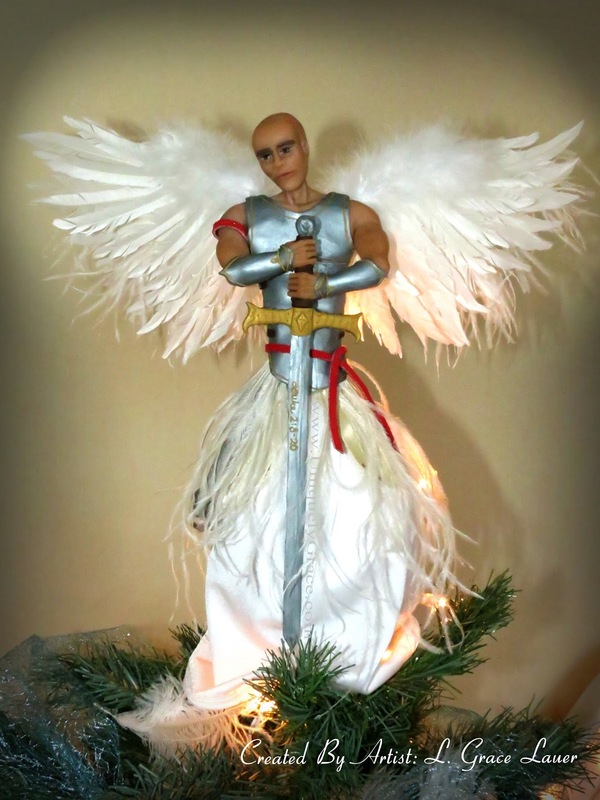 We all know the true meaning of Christmas is Christ's birth. This room and space is dedicated to our Lord and Savior. This is a photo heavy post so grab your favorite cup of coffee or tea, cuddle up with your warm blanket by the fireplace and welcome into my home. 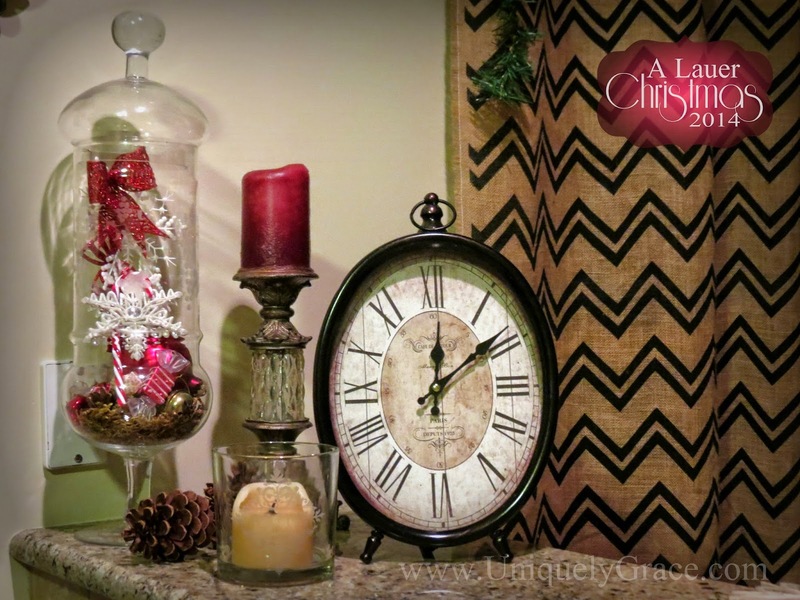 I would love to give a HUGE thank you to Michelle over at Shelstring who organized this Winter Wonderland Holiday Home Tour blog hop. 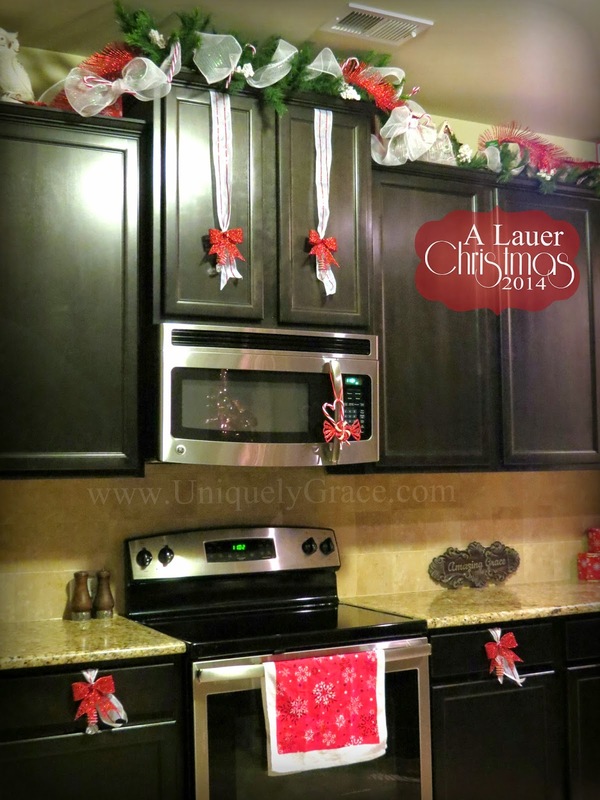 EDIT 12/18 - Today I am honored to be a part of a second Parade of Christmas Home Tours! This home tour has been well organized and generously hosted by Up To Date Interiors. 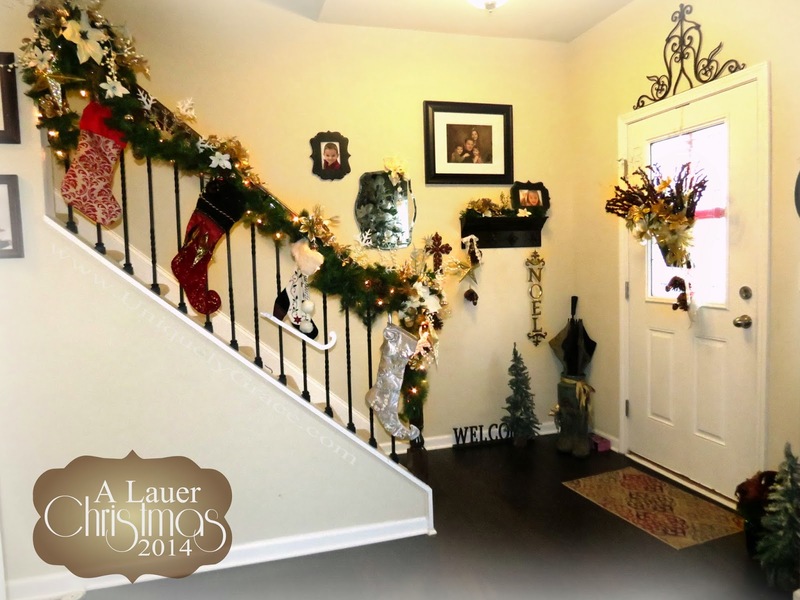 Thank you Kathryn for allowing me to be a part of your special on Bloggers Best homes. Sometimes all it takes a few small items to spruce up what you all ready have. 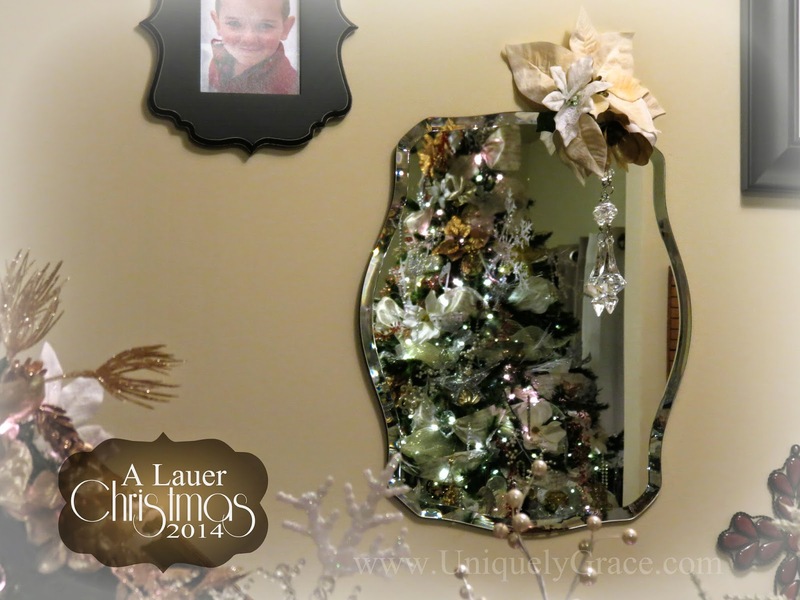 This vintage mirror was already hanging in our entry and I added some flowers and a crystal ornament. 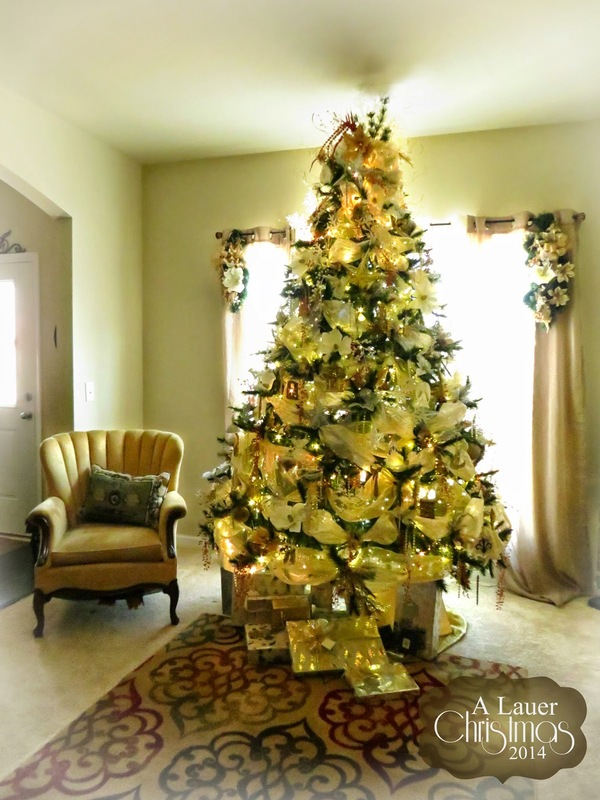 It also happens to be in a good position to reflect our tree in the front room. This year we changed up the exterior decor and my normal door hanging didn't match so I flipped it around and put it on the inside. It makes for a wonderful welcome to the inside entry. 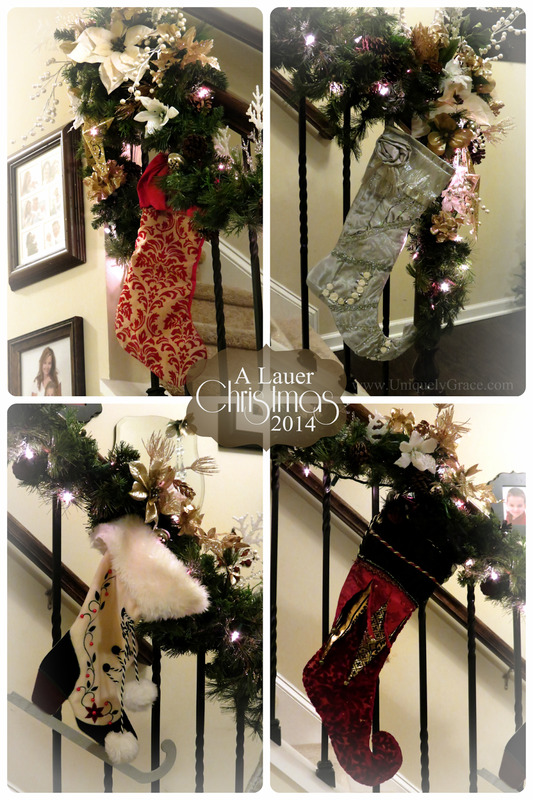 Our stockings are hung with such care on our banister since our new home doesn't have a fireplace. My Hubby left these boots at the front door, probably with no thought of it, when he walked out that door almost three months ago to serve overseas. They have not left this spot. I put an angel on them to remind us to pray for his protection and a magnolia flower which represents "life force" and for him to come home to us here in the South. In the front room we have our "biggest" tree. 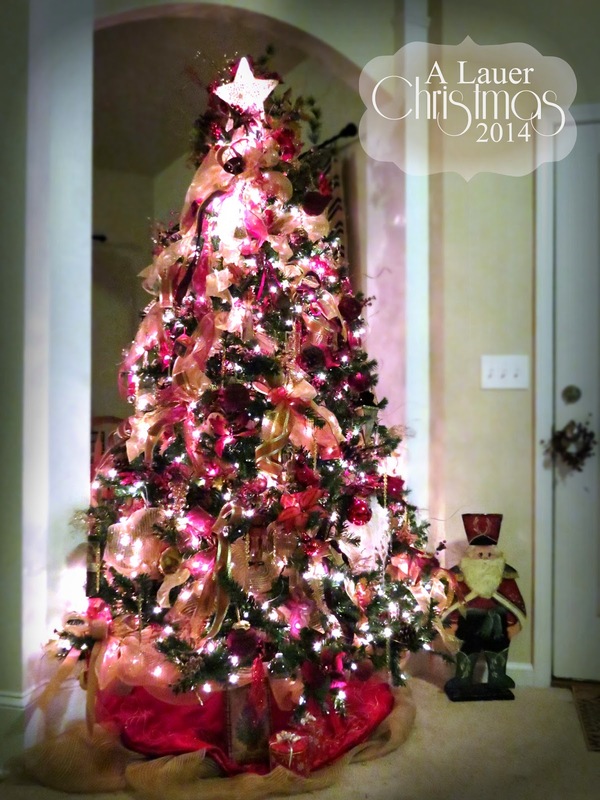 We loved this tree in our old house as it stood 9' tall in a two story room with a base of 6' diameter at the bottom. However after our move this year we had issues with it actually touching our ceilings here. 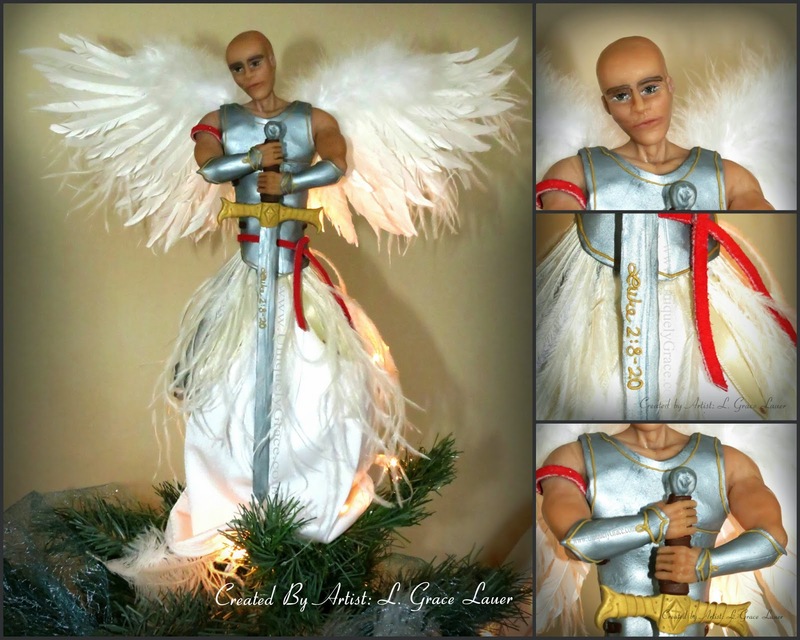 So our glorious angel was not able to sit atop our nativity themed tree. However she is on display in the room and we still loved how it turned out. 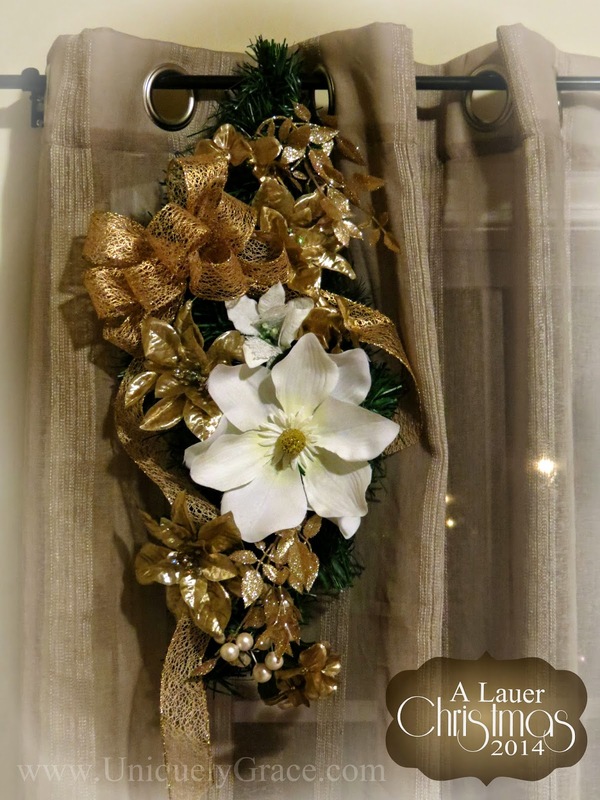 These lil' decor items hanging from my curtain rod on each side of the window were thrown together with mostly Dollar Tree items and some clearance ribbon from a few Christmases ago. 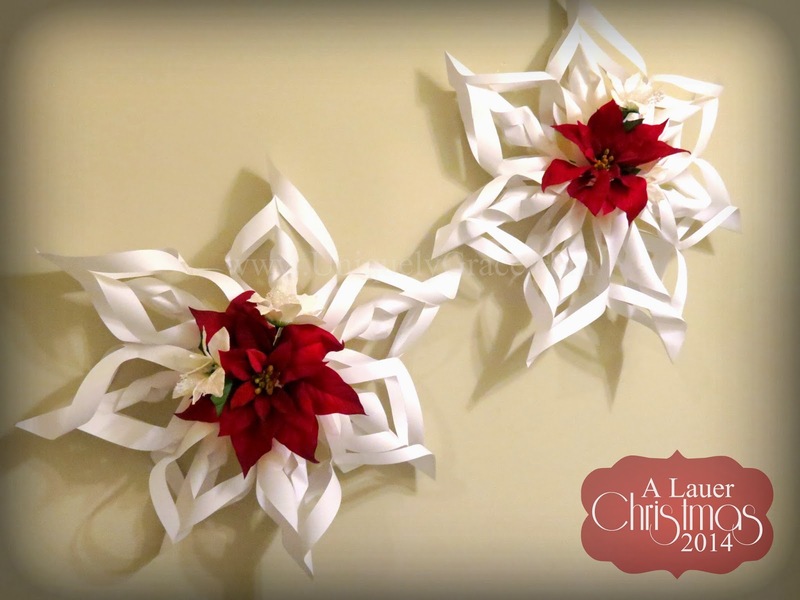 The dollar store had these fantastic clip on magnolias that are all over our tree and since we are now living in the south they have replaced our larger white poinsettias. We love our books around here so we just could not part with packing them up to have more room to decorate so they have little trinkets, flowers and LED candles mixed right on in. Our favorite book and one of many of our book readings Holiday Tradition is the Polar Express, displayed here next to our angel tree topper that would not fit atop the tree this year in our new home. 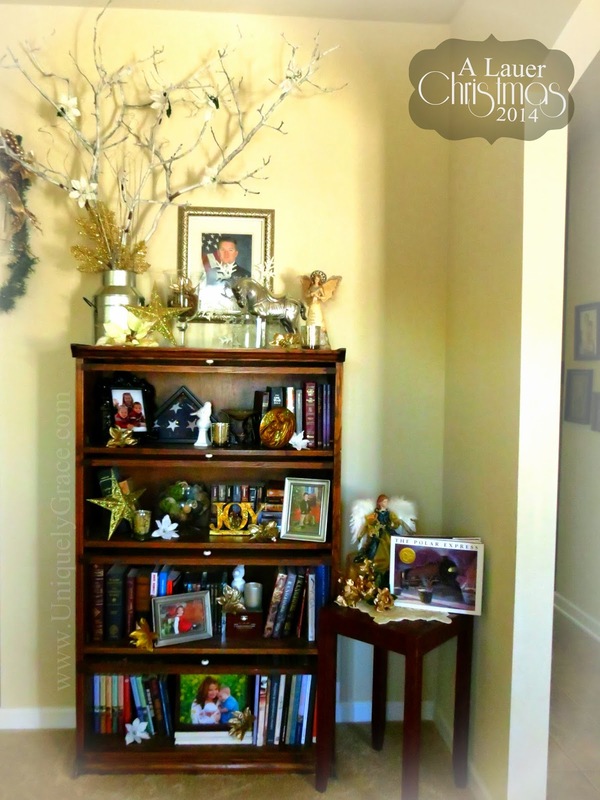 The bookcase is adorned with little poinsettias and sweet nativity pieces. 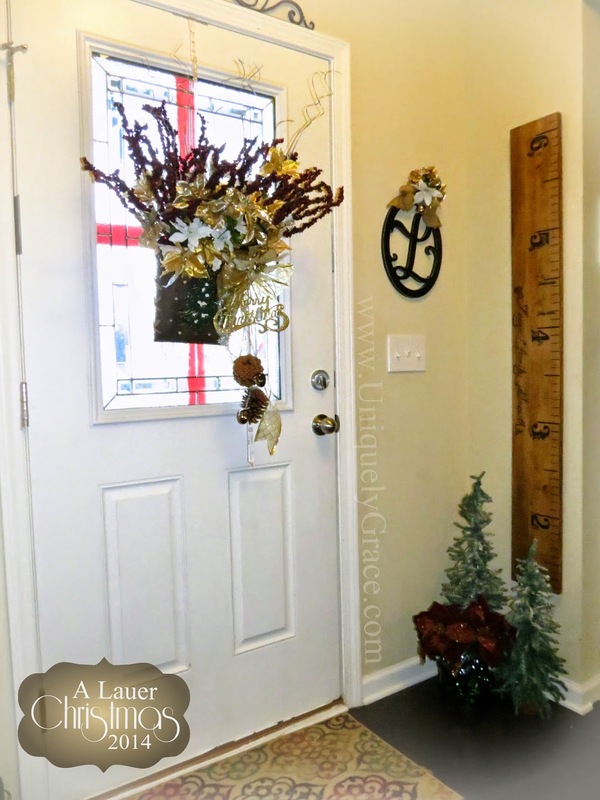 I wanted something a bit different this year then in the past and bringing some scrub oak tree branches from outside in was the perfect thing. These were limbs that were dead already and I took some white spray paint and dusted them all over, added them to the galvanized steel pot and some Dollar Tree poinsettias into the branches. We don't have a mantel in our new home so this is where I decorate our "mantel". 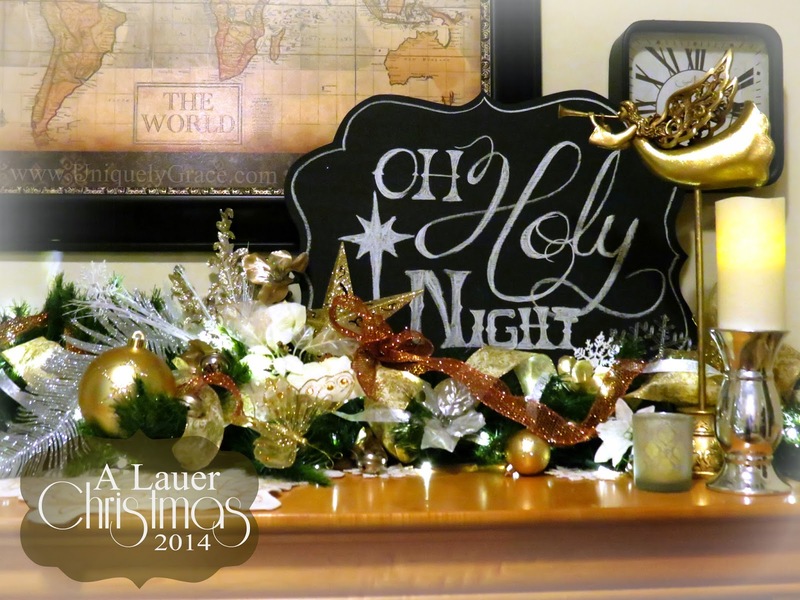 One of my favorite parts in this room aside from the tree is my chalkboard sign and my angel announcing the coming of the Christ Child. 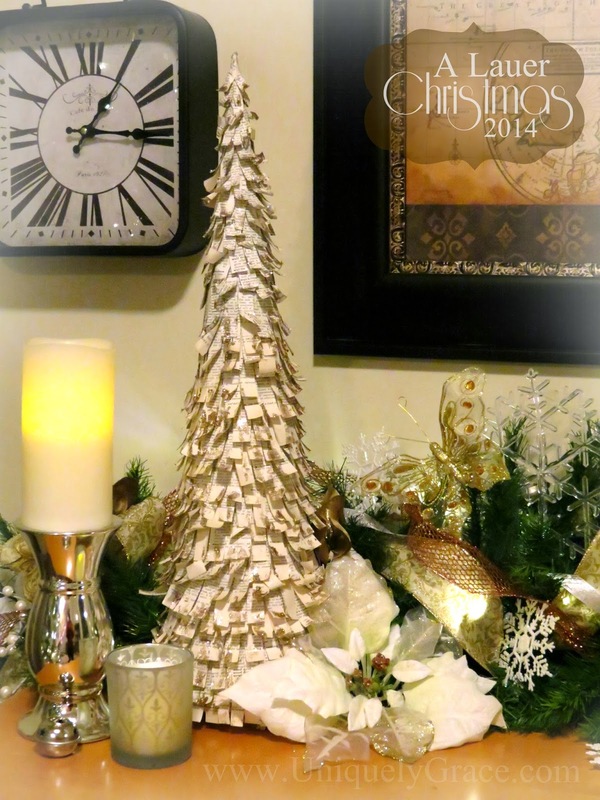 This book page tree is one of the items that are hand crafted. 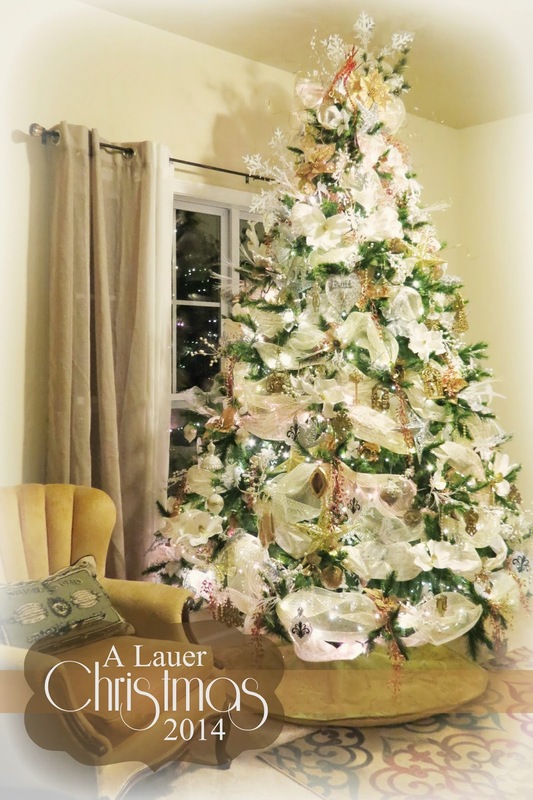 I am a window designer for a book store where I make art and home decorations out of books and this is one of my favorite trees I have made. Just had to keep it. 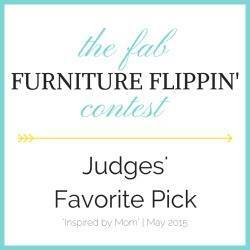 I am so honored to be highlighted in this blog hop right along side of these fantastic homes. Please take a moment to relax and view this beautiful Parade of homes with all sorts of styles and colors. Merry Christmas! I would love to hear from you! Please leave a comment below, pin an image you like or share with a friend. 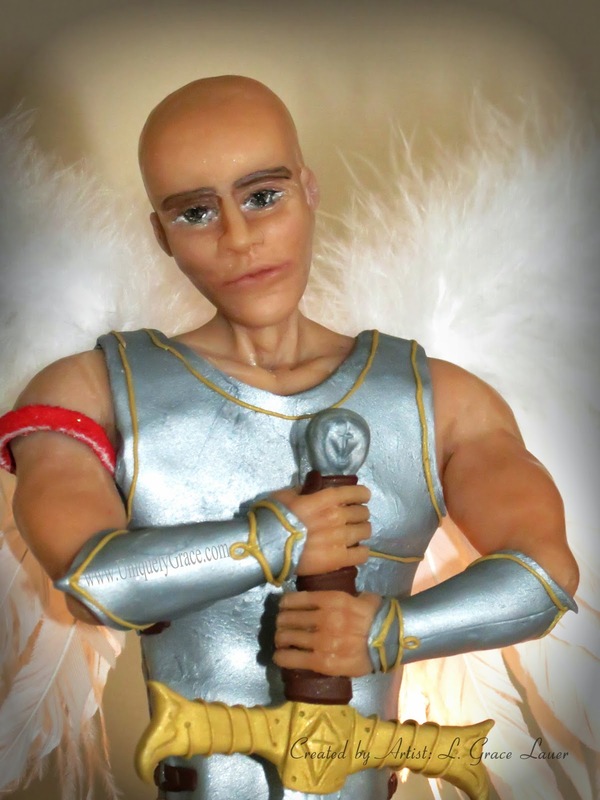 Thank you for your support and I hope you enjoyed this post. 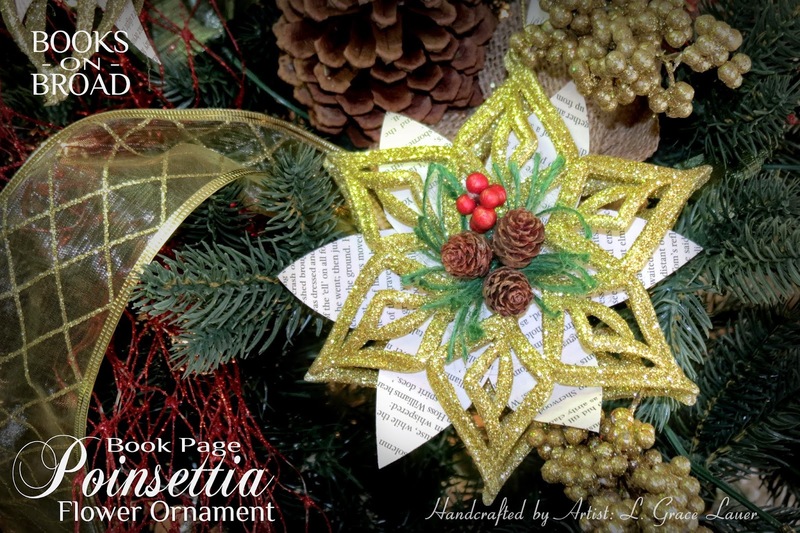 I was so thrilled when I was able to design an ornament this year that was in the shape of one. I was able to make these in three colors. Gold, Silver and White. What do you think? Please let me know in the comments below. SOME TIME AGO, I heard a lovely Christmas story about Maria, a young girl who lived on a poor family farm in a small village in Mexico. It was a custom in the village to glorify the Christmas season with special events to celebrate the birth of the Christ Child, Jesus. Everyone took part in the preparations by festively decorating the village church and the piazza in front of it. Even the children helped by making gifts to give to the Baby Jesus on Christmas Eve. 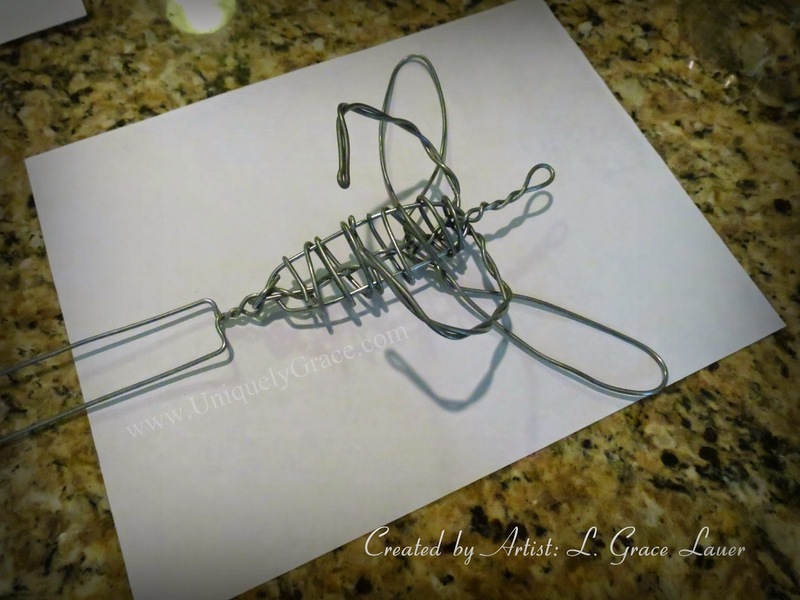 Maria wanted to make a very special gift. She had helped her mother before with the loom, so she tried, on her own, to weave a colorful blanket. But Maria was too inexperienced and the yarns became an entangled mess. Maria was heartbroken. She wanted so much to be able to march in procession with the other village children, but she had no gift to give to the Christ Child. Finally it was Christmas Eve! The villagers gathered in the piazza. 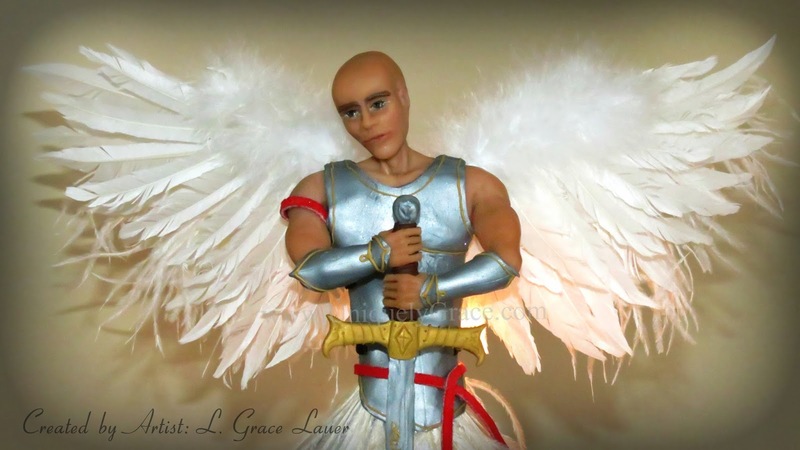 Some whispered that they thought they could hear angels singing tonight. Everyone was ready. Holding lit candles, all the villagers began to process down the aisle amid joyous music and singing. All except for Maria, who hid in the shadows, watching with tears in her eyes as the procession to the church started. 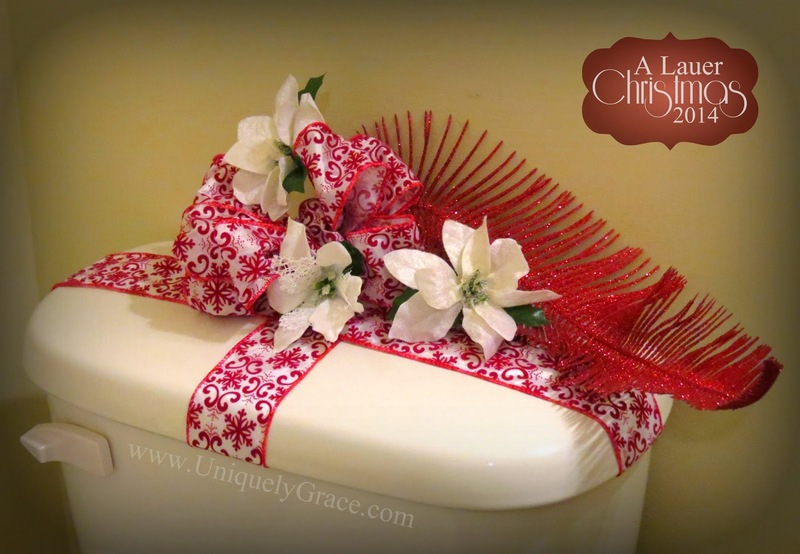 "I don’t have a gift for the Baby Jesus," she sniffled softly. "I tried and tried to make something beautiful, but instead I ruined it." Suddenly, Maria heard a voice. She looked up and saw only a bright star in the sky; it seemed to hover and shine over the village church. Was it this star that spoke to her? 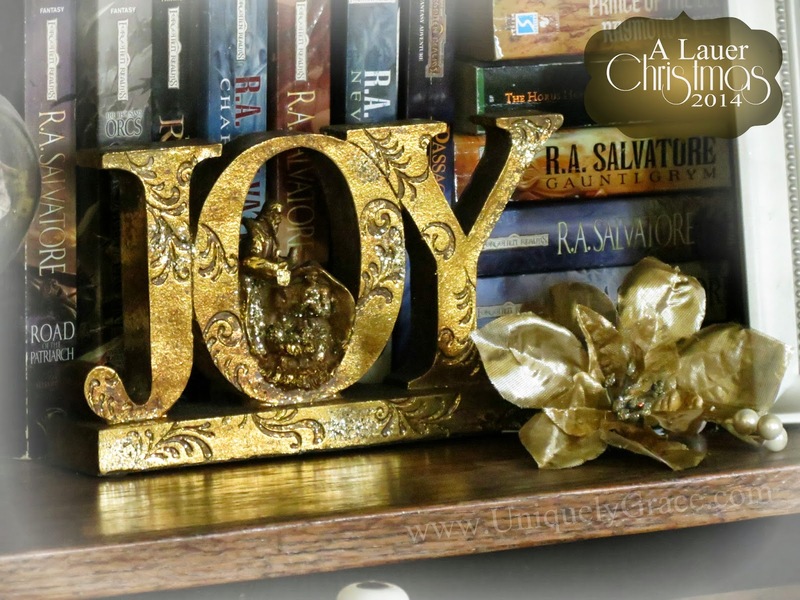 "Maria," she heard the voice again, "The baby Jesus will love whatever you give because it comes from your heart. Love is what makes any gift special." With that, Maria stepped out from the shadows. Nearby she noticed some tall green weeds. She rushed over and quickly filled her arms with the weeds, covering them with her manto. Then she ran swiftly to the church. 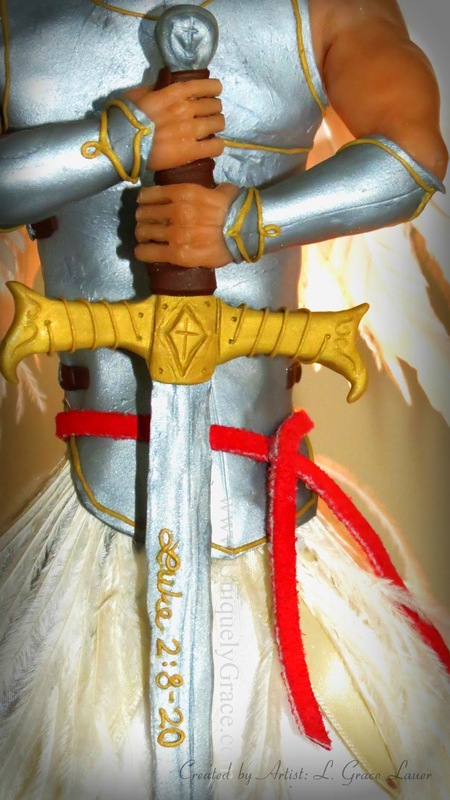 By the time she arrived, the candles were ablaze and the children were singing as they walked down the aisle carrying their gifts to the Christ Child. Padre Francesco placed the figure of the baby Jesus in the manger, with the children’s gifts all around it. Suddenly, Maria was scared when she saw all those people dressed in such beautiful clothes, and she was dressed so poorly. She tried to slip behind one of the big pillars, but she was too slow. Padre Francesco saw her. "Maria, Maria," he called out. "Hurry girl, come, bring up your gift!" Maria was terrified. She wondered, "Do I run away? Do I go forward?" The Padre saw her apprehension and coaxed her more gently, "Maria, come up here and see the Baby Jesus. There is space left for one more gift." Before she could think, Maria found herself walking down the main aisle of the church. "What is Maria carrying under her manto?" the villagers whispered. "Where’s her gift?" Padre Francesco stepped down from the altar and walked with Maria to the Christmas crèche. Maria bowed her head and said a prayer then opened her manto and let the weeds tumble out. Voices gasped, "Look! Look at those glorious flowers!" Startled, Maria opened her eyes. She was stunned. For each weed was now topped with a flaming, bright, red star. And outside, too, every weed now bore a bright red star. Maria's Love had created a miracle. I hope you all have a wonderful holiday. 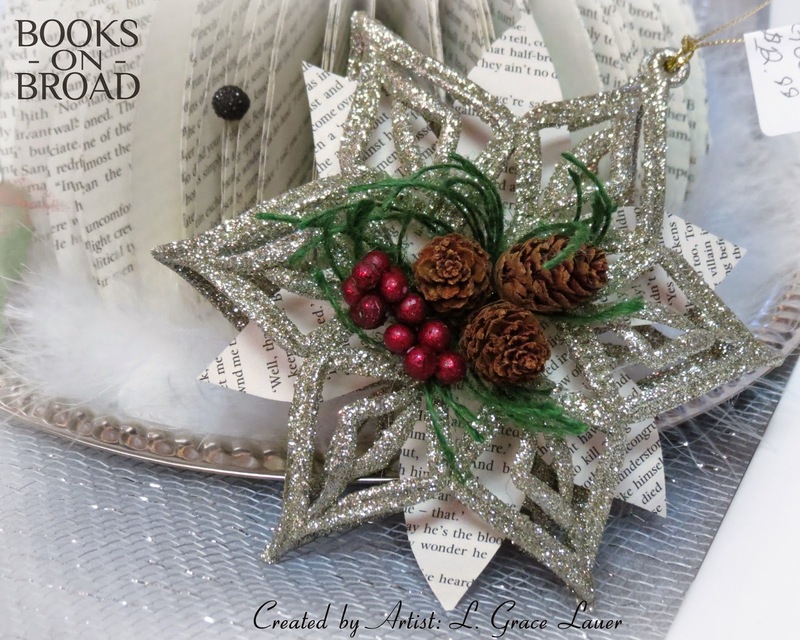 Please leave a comment below and if you would like one of these ornaments contact +Books on Broad or myself (see list below) and we can see what we can do.